GinnyPenny Steampunk Robots are all one-of-a-kind and only offered on a very limited basis. Each robot is different. I use unique vintage buttons. All my robots are made by hand, every stitch. Steampunk robots have extra details and embroidery. 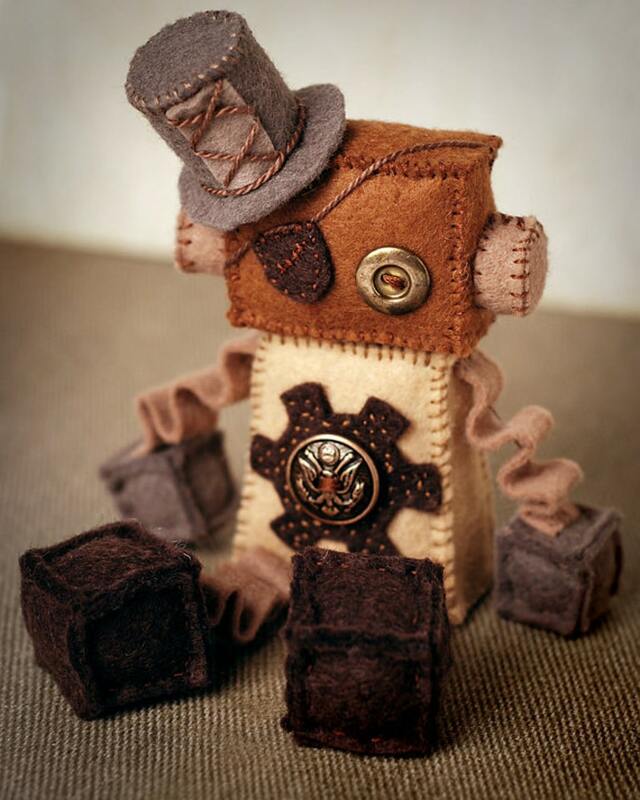 This listing is for a customized Steampunk robot. You can pick some of the details. Look through the pictures and select from the drop down menus on the side what you would like. Select "Surprise Me" if you want me to be creative and pick for you. I will pick the colors, buttons and embroidered details. Don't hesitate to contact me if you have a special request. Please keep in mind that I won't be able to use the same buttons as the ones you see in the pictures. They are vintage. I buy them at consignment shops and thrift stores and rarely ever see two of the same button. Robot is about 4 inches tall sitting, not including hat. It is made of premium wool felt and cotton embroidery floss. The images are examples only. They all have loving homes and yours will be unique.